A study from the University of Colorado Boulder found that children who missed their afternoon nap showed less joy and interest, more anxiety, and poorer problem solving skills than other children. The same can be seen in adults that benefit from napping. Researchers with Berkeley found an hour nap to dramatically increase learning ability and memory. Naps sort of provide a reboot, where the short term memory is cleared out and our brain becomes refreshed with new defragged space. 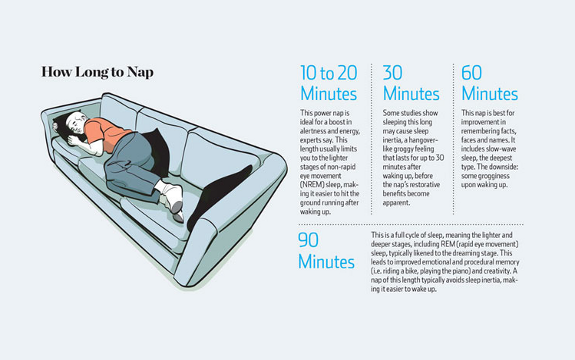 So how long should you nap? Experts say a 10 to 20 minute “power nap” is best for refreshing your mind and increasing energy and alertness. The sleep isn’t as deep as longer naps, which allows you to get right back at your day upon waking. A 30 minute nap can lead to 30 minutes of grogginess, as you are often waking just as your body enters the deeper stages of sleep. You’ll experience some of that same fogginess if you sleep for an hour, but 60 minute naps are good for memory boosting. The longest naps—around 90 minutes—are good for those people who just don’t get enough sleep at night. It’s a complete sleep cycle and can improve emotional memory and creativity. Its not about sleeping 8 hours, its about sleeping early! What killed Ranjan Das and Lessons for Corporate India ? A month ago, many of us heard about the sad demise of Ranjan Das from Bandra, Mumbai. He was very active in sports, was a fitness freak and a marathon runner. It was common to see him run on Bandra’s Carter Road. Just after Diwali, on 21st Oct, he returned home from his gym after a workout, collapse with a massive heart attack and died. It was certainly a wake-up call for corporate India. However, it was even more disastrous for runners amongst us. Since Ranjan was an avid marathoner ( in Feb 09, he ran Chennai Marathon at the same time some of us were running Pondicherry Marathon 180 km away ), the question came as to why an exceptionally active, athletic person succumb to heart attack at 42 years of age.Was it the stress? However, everyone missed out a small line in the reports that Ranjan used to make do with 4-5 hours of sleep. Last week, I was working with a well-known cardiologist on the subject of ‘Heart Disease caused by Lack of Sleep’. ! While I cannot share the video nor the slides because of confidentiality reasons, I have distilled the key points below in the hope it will save some of our lives. Short sleep duration ( <5 or 5-6 hours ) increased risk for high BP by 350% to 500% compared to those who slept longer than 6 hours per night. Paper published in 2009. As you know, high BP kills.Young people ( 25-49 years of age ) are twice as likely to get high BP if they sleep less. Paper published in 2006. Just one night of sleep loss increases very toxic substances in body such as Interleukin-6 (IL! -6), Tumour Necrosis Factor-Alpha (TNF-alpha) and C-reactive protein (cRP). They increase risks of many medical conditions, including cancer, arthritis and heart disease. Paper published in 2004. Sleeping for <=6 hours per night leads to 18% increase in heart disease. Paper published in 2006. The earlier part of sleep is mostly non-REM. During that period, your pituitary gland releases growth hormones that repair your body. The latter part of sleep is more and more REM type.For you to be mentally alert during the day, ! the latter part of sleep is more important. No wonder when you wake up with an alarm clock after 5-6 hours of sleep, you are mentally irritable throughout the day (lack of REM sleep). And if you have slept for less than 5 hours, your body is in a complete physical mess ( lack of non-REM sleep ), you are tired throughout the day, moving like a zombie and your immunity is way down ( I’ve been there, done that ).